Continuing with our How to Purchase series on glycol chillers, this article lays out the specifications and other tips you need to consider before you purchase. For an introduction to glycol chillers, check out Part I here. How powerful should my glycol chiller be? The main specification of any glycol chiller is its capacity in BTUs/HR. A BTU is a British Thermal Unit, and is defined as the amount of work needed to raise the temperature of one pound of water by one degree Fahrenheit. 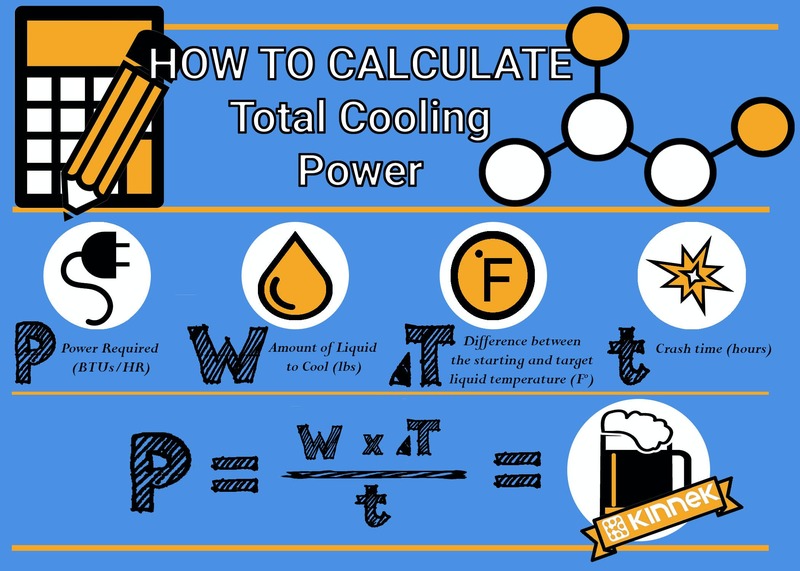 Therefore, in order to calculate the capacity, you need to know the power, or the amount of water (in pounds) the system can cool by 1 degree Fahrenheit in 1 hour. To match your needs with a sufficient capacity chiller, you can calculate the total cooling power needed at a given instant. There are a number of ways to calculate this but the basic rule can be found in the graphic below. 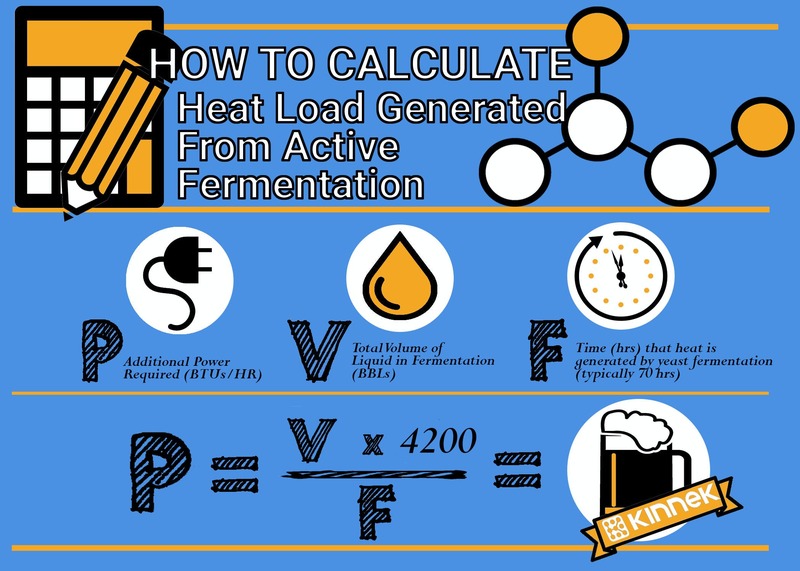 In addition you will also have to account for the heat load generated from active fermentation. In order to calculate, change up the numbers and follow the math in the graphic below. While calculating your glycol chiller needs, you should also take into consideration any future expansion plans. It is much easier grow into a higher capacity chiller than to have to the pain of upgrading an existing system which may result in higher total costs and disruptions to your operations. What’s the estimated cost of a glycol chiller? 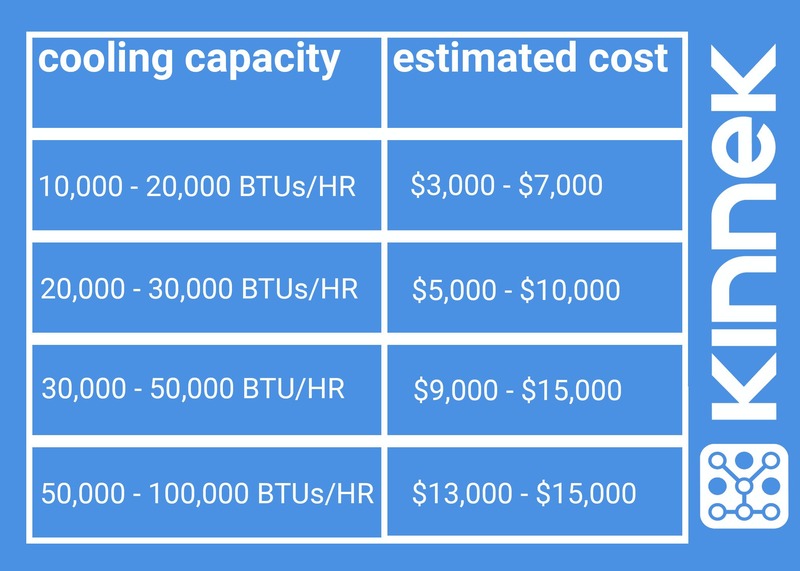 Once you have taken note of your cooling capacity, you can get a good estimate for the relative price range of a glycol chiller The table below will give you a ballpark estimate of glycol chiller costs based on total nominal cooling capacity. Please note that prices vary based on a variety of different factors and you should request a quote based on your specific situation so our suppliers can provide you with more exact quotes. What are some other things I need to know before making a purchase? Make sure the chiller has a hermetic compressor. “Hermetic” compressors have motors that are fully sealed in an enclosure (usually welded). In contrast a "semi-hermetic" compressor is sealed in an openable enclosure (typically bolted-gasketed joints). It is generally better for a brewery chiller to be hermetically sealed within the system to avoid any pressure or coolant loss and to prevent external contaminants from entering the system. Be aware of the power source requirements of the chiller unit: Be sure to check that the power source requirements match what you have available at your facility. Some heavy duty chillers require 3 phase power and 460V outlet, while others just require a standard 230V Single Phase outlet. If the equipment you are purchasing was manufactured overseas, ask your supplier if it has passed standard electrical certifications. Also, whoever installs the equipment should have proper certification from the Environmental Protection Agency (EPA). Be aware of the glycol to water ratio: Typical glycol percentages are 30% to 40% glycol to water depending on your outdoor temperature. A lower outdoor temperature may demand a higher percentage of glycol. Use a glycol refractometer to measure and track your glycol mixture percentage. Clean chiller unit grills and condenser fin surface by using a stiff bristle brush, vacuum cleaner, or compressed gas. Visually inspect piping for signs of ice buildup, insulation damage and glycol leakage. When things go south, Jim VanderGiessen Jr. from Pro Refrigeration Inc. provides an excellent troubleshooting primer when you get a freeze, flow flow, or pressure alarm. The Kinnek glycol chiller request form lists these questions and more, allowing you to quickly obtain a custom quote from multiple suppliers without having to do all the research yourself. Kinnek let’s the suppliers come to you!